Thanks for joining me in another Paper Craft Crew challenge! Have you noticed some changes on our Home page recently? Our Team coordinator, Pam Staples, has updated the page design to a fresh new look, and to go along with that, we’re expanding the types of challenges we’ll be holding! We’ll have not only our regular sketch challenges, but we’ll be mixing things up a bit by adding in other challenges such as colour and theme challenges. This week’s challenge is a new one: Tic-Tac-Toe! The challenge is to choose any 3 items in a row – either horizontally, diagonally or vertically. For my challenge, I chose to do the bottom horizontal row – ‘flower, ribbon and gold coloured embellishment’. Uh-oh!! I thought it was supposed to be gold ’embossing’! *face palm* Well, I hope you enjoy my card anyway – it does have a flower, some ribbon and ‘gold’! First, I stamped the inside flower detail/veins onto Real Red cardstock in Versamark ink, coloured them with Gold Embossing Powder and heat set it with the Heat Tool. I then punched out 4 of the largest petals, 8 of the 2nd largest and 2 of the joined duo-petals. I then punched out three 1″ Real Red cardstock circles, and one 1/2″ Real Red cardstock circle. I created the flower by first attaching the 4 largest petals onto one of the 1″ circles, then attaching 4 of the medium sized onto each of the next two 1″ circles, then finally the two duo-petals onto the 1/2″ circle, and layered them all on top of each other, using the Tombow Multipurpose Glue. I then punched out 2 of the ‘x’ shapes for the flower center in Crushed Curry Cardstock, and glued them directly onto the center of the flower; I finished it off by adding a Basic Pearl Embellishment. Next, I stamped the watercolour look flower image stamp onto Whisper White cardstock first in Real Red ink, then in retired Gold Metallic ink. I added the leaves in Pear Pizzazz ink, then ran the stamped panel through the Big Shot using the Softly Falling embossing folder – showing the de-bossed side up. After stamping the sentiment in Real Red ink onto Whisper White cardstock, I used the Banner Triple Punch to create the tag look, and created a tag to layer behind it, in Real Red cardstock. 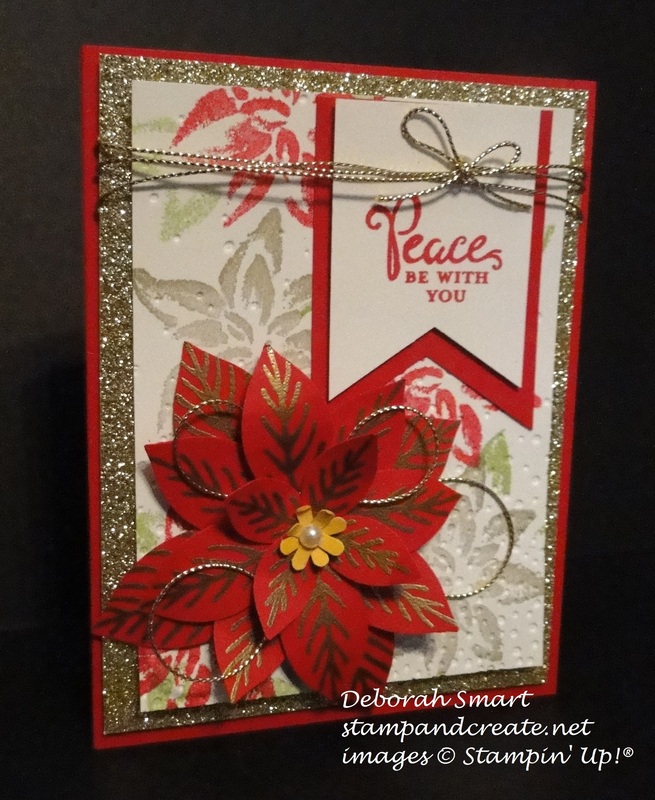 I attached the punched poinsettia and the sentiment tag using Stampin’ Dimensionals, then wound the Gold Cording Trim around the top of the panel 3 times and tied it off in a bow, then added some loops of the Gold Cording to the poinsettia. I then layered the entire panel onto a piece of Gold Glimmer paper, and then attached it to a card base of Real Red cardstock. Well, despite my misreading of ’embellishment’ as ’embossing’, I hope that you enjoyed my card; if you have time to leave a comment, I always love to read them! 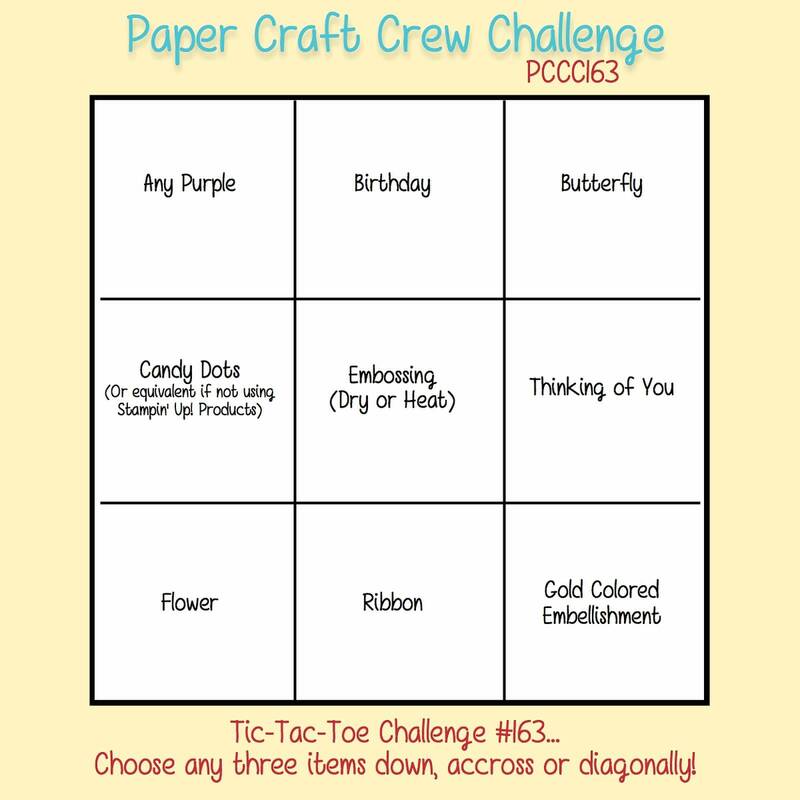 Please be sure to head over to the Paper Craft Crew home page – the rest of the design team has some amazing cards for you – I’m pretty sure everyone chose a different line in the Tic-Tac-Toe, so each card is truly unique! We’d love to have you play along with us – you never know when you will be our next Top Pick!